In terms of concept, Mountain Hardwear's updated Skyledge 2.1 tent strikes me as very similar to REI's best-selling Quarter Dome. Both tents are members of what you might call the economy side of the ultralight family (a small offshoot, to be sure). Unlike high-priced relatives like MSR's Carbon Reflex Tent, which employ exotic materials and creative geometry, the Skyledge sheds pounds the good old fashioned way: by reducing overall dimensions and thus total materials. With an 85x40" footprint and a 39" ceiling, The 3-pound 8.5-ounce (measured) Skyledge will definitely be cozy for two. This issue is exacerbated by the tent's low-angled walls, which make it feel smaller than it actually is. On the positive side, you do get doors on both sides of the tent, plus generous double vestibules (including a vinyl window) which effectively double the tent's floor space. For those who absolutely must have more shoulder room, you can upgrade to the Skyledge 3.1—albeit for another pound of total weight. Design and durability both look quite good. There's nothing unusual going on here to shake your head at. The fly is asymmetrical, to match the tent floor, but once you get that figured out, everything else is entirely traditional and straightforward. For many of us, that's a selling point in its own right. The Skyledge's double-wall tent-and-fly design inspires confidence in rainy weather, and comfort, thanks to the double-awning options. Mountain Hardwear says the polyether-coated 70D floor is three times as abrasion resistant as standard PU, and resistant to the hydrolyzing decomposition that eventually turns your beloved old plastic tents into goo (alas, my poor Roadrunner!). Tent poles and fabric throughout feel solid rather than flimsy. All exterior seams are of course taped and fully waterproof. To me, the big appeal of the Skyledge 2.1 is its weight. You're saving a full pound compared to MSR's Hubba Hubba, and you're still getting a double-wall tent with a separate rain fly. At three pounds eight ounces, the Skyledge is just starting to look tempting to me for solo use in conditions where I'm not comfortable with a single-wall tent (ie, lots of rain). As a two-man tent, two smaller (or very friendly) hikers or climbers will certainly not mind sharing the available space, but bigger or more aloof pairings will likely want a bit more room. 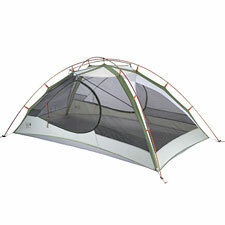 Still, you get a lot of features and quality at this price point, plus an undeniably light tent. Who can argue with that?